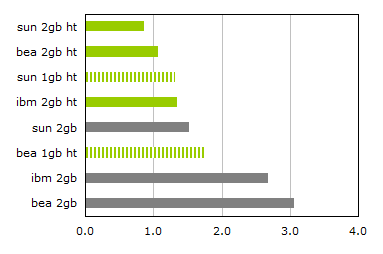 How much does doubling the available memory improve performance? Mirror, mirror on the wall, who has the fastest JVM of them all? The machine in question has a single 2.8GHz Intel Xeon processor with 2GB RAM and is running Linux (2.6.9-42.0.3.ELsmp). The application is a web application with a large (several gigabytes) Lucene index and Berkeley DB for storing data. The main interest was the performance of the data import procedure, though I also had a brief look at the search and retrieval performance. Note that even though the machine has a 64-bit processor, I used the 32-bit versions of the JVMs as these are faster than (or the same speed as) the corresponding 64-bit versions (depending on whether the JVM is smart enough to always use 32-bit pointers whenever the heap size is small enough). Some of the tests were repeated with some of the JVM parameters described by Henrik Stahl. But I never managed to beat the default configuration! So I ended up using only -Xms and -Xmx for all tests. Hyper-threading can slow down single-threaded applications a bit (perhaps depending on whether the bottleneck is garbage collection, which can be done in a separate thread, or IO). 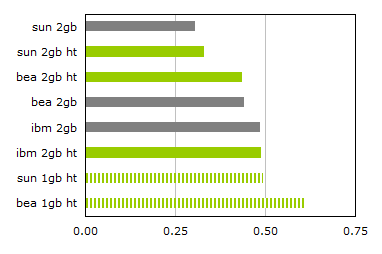 But as soon as there are lots of threads there appears to be a clear benefit in keeping hyper-threading enabled. More memory is better (surprise)… Doubling the memory in the system from 2 to 4gb (and increasing the heap size from 1 to 2gb) improved performance by about a third for some configurations. Doubling again however may not be worth the expense (diminishing returns). 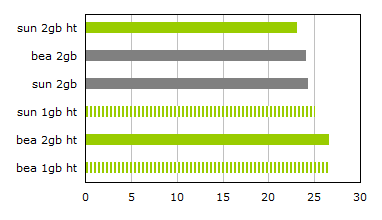 The latest version of Sun’s JVM appears to be a bit ahead of the others… for now!